I’m not sure why I bother with new years resolutions…. It’s February 19th and my “blogging at least once per week” has not been even remotely successful since my last on December 29th. I have so many beautiful sessions to share that i just need to buckle down and get the images prepared because I am really very excited for you to experience even a taste of what these evenings gave us. The energy, the sunsets, the tides, the moon rises….it all just fills me up with such gratitude on so many levels. I am jumping around quite and instead of heading back to 2016 to finish up what has yet to be journaled here, I am going to take a more recent step back to this past summer. I photographed these girls about 4 years ago and was so happy to get the chance to see them again, more grown up, outgoing and playful. The evening could not have been more beautiful–a welcomed change after being rained out twice prior. I’m sharing as it’s definitely one of my favorites from 2017 and I hope you love it too! Kelsey - Hi! 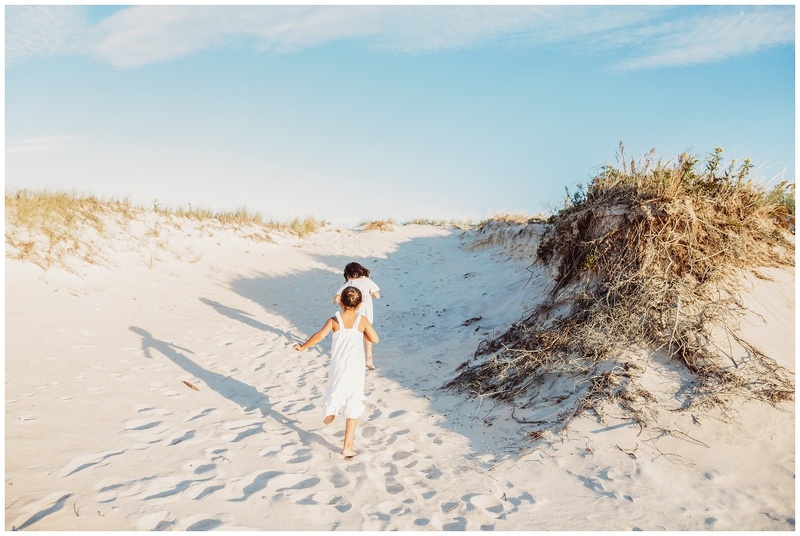 I was wondering if you offered beach photo shoots for one person (instead of family). I want lifestyle photos for my instagram, and website! I am an online health coach! 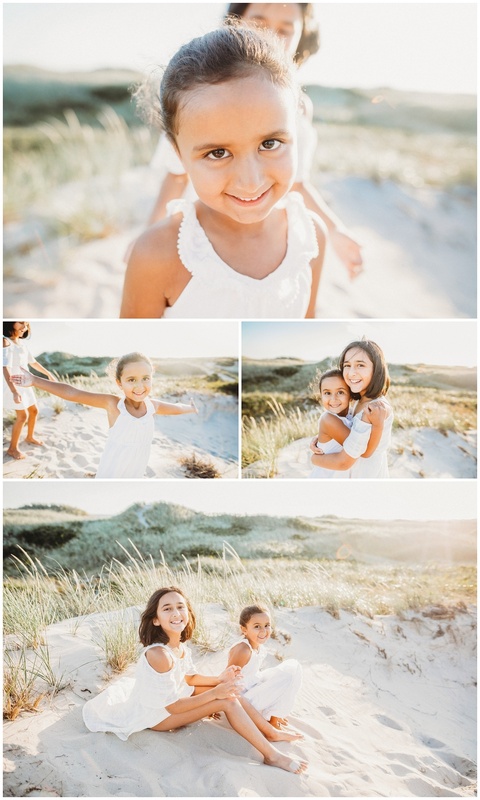 The beach family photoshoot above is BEAUTIFUL, and everything I want for my photoshoot! Let me know! Thank you. Christmas Card 2017…each year I’ve tried to come up with something new and better than the year before. I wanted to do something beautiful AND clever, leaving the composited polar bear and photoshopped reindeer behind. About 5 years ago I did a retro shoot for The Measure and had this gorgeous 1964 Mercury Comet as a prop, thanks to my wonderful neighbor who was kind enough to let me use it. I knew at some point I would want to use it for a personal shoot but for the past couple of years I just couldn’t make it happen. On my way to scout a farm location I passed by this old diner, put it in my mental rolodex for a future shoot and kept driving. Knowing that I was using the car for this year’s holiday card it was a no brainer that the diner would be the perfect backdrop. The boys’ outfits were already purchased and it was serendipitous that it all coordinated with the Star Drive-in sign. All my anxiety about having it make sense, be clever and look great was all for naught. In my eyes, it couldn’t have turned out any better. Proud mama here! People have asked if I’m already thinking of next year’s card–YES! Yes I am! I figure I only have a handful of years that the kids will humor me with these shoots so I am going to take advantage of it as long as I can! My uncle is a professional photographer in NY so whenit was time for me to have my senior portraits done I headed down to Long Island with my best friend to to have them taken. I look back at those photos and in comparison to how they are done now it’s almost comical just how different our approach was back then. Not to mention just how gorgeous and put together girls are today. Looking back at my huge permed hair with horrible bangs and a corderoy collared shirt buttoned up to the very top?? Cringe. How did girls become so in tune with beauty and fashion? There is no way they could ever look back at their high school photos and facepalm like I do. How many of you 90’s kids rocked that Champion sweatshirt with a turtleneck underneath? Or the pegged pants and scrunched down socks? Shudder. All kidding aside, these images are simple and beautiful. A breath of fresh air. If you are on the South Shore/Plymouth County area and are still looking for a senior portrait photographer please reach out anytime. My senior portrait sessions are offered as mini sessions. Book with a friend and I’ll give you a special deal! Email or call anytime for details! What I’ve come to learn and love about the beach is that everytime I go the landscape in and of itself is ever changing. No two beach sessions look alike because of tide — how the higher water line bring up rocks or seaweed– the sunsets, clouds, light and in this case FOG! When I drove off the exit it was sunny with beautiful fluffy white clouds. As soon as I got about a half mile from the beach you could see the wall of fog. This was not like the fog I had experienced the previous week which was much darker and very wet and not camera friendly. This was like an bright etheral blanket of fog that eminated a pink hue that was sort of unworldly. I said then that it was etheral and felt it was apropos considering that my client is a spirit medium! Even the loads of seaweed which I don’t care for imparted this stormy “swept ashore” look for her and her twins. The shots at the end have such a timeless and mystical feel to them. Ksenia - I am in love! This session is so perfect!!! Sarah Fecko - This family must be beside themselves with how amazing these came out! Irene - Beautiful beach photo session. 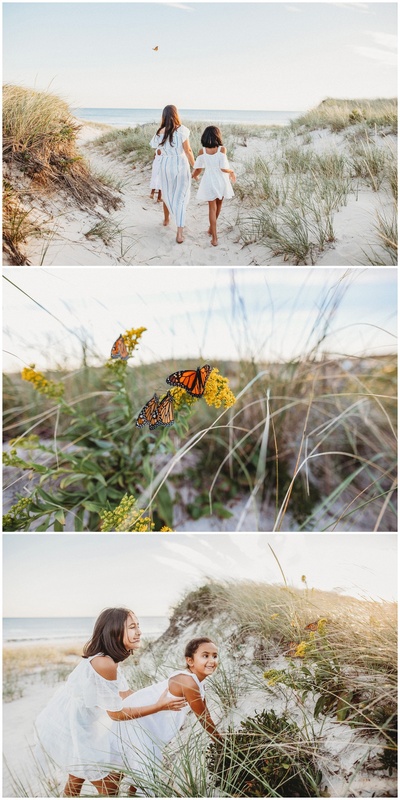 I love family photo sessions at the beach! Krista - Beautiful and so natural! Melissa - LOVE this entire session! Gorgeous! oh and I love the moms dress! To die for! Cendrine Marrouat - What a fantastic session it must have been. The ethereal quality of the fog and the way you used the light to your advantage are incredible. Wow! Kara - Absolutely, positively… exquisite. Juliet Carey - Absolutely BREATHTAKING!!!!!!!!! !